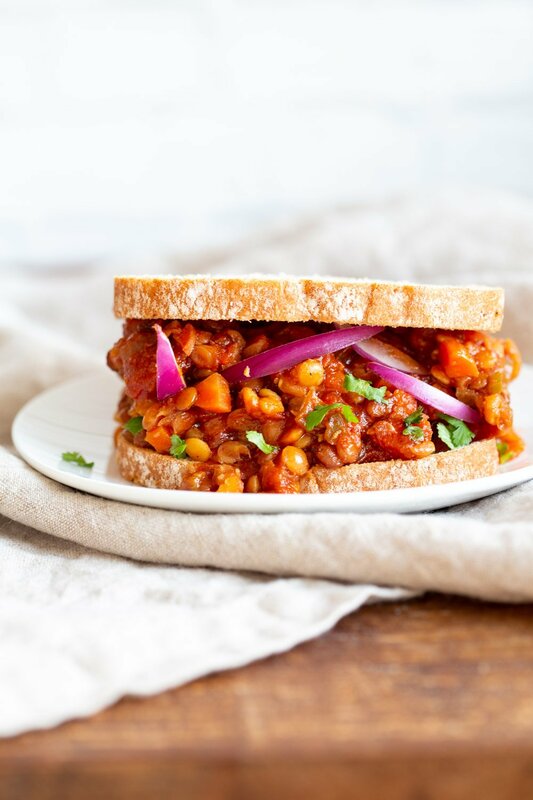 Lentil Sloppy Joes are a quick meal filled with protein and tons of flavor. They pair well with various condiments. Serve these with some pickled onion, slaw or other toppings. Serve them in wraps or sandwiches or over baked potato, baked fries or potato salad. Make a bowl with some veggies, dip and toasted bread! Lentils come in various colors and have different cook times. They also vary in flavor. 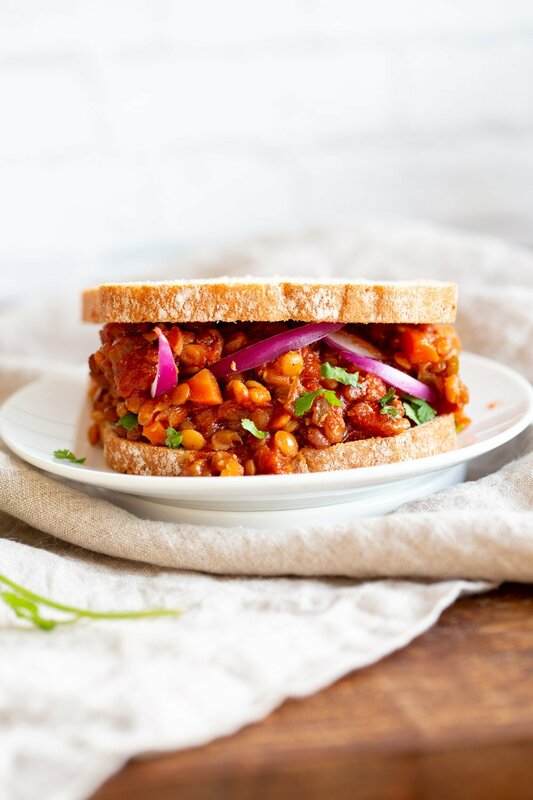 I use green lentils for these vegan sloppy joes as they are more hardy and don’t get mushy easily. They are cooked with onion,pepper, carrots, celery, seasonings such as taco, chili or bbq, and tomato. The result is this hearty flavorful saucy sloppy joes. You can vary the flavor with other herbs and blends, add more or less tomato to preference. Lets make these! As always, saucepan option is in the notes. These sloppy lentils are freezer friendly and meal prep friendly. Refrigerate for upto 4 days and freeze for upto a month. Serve these in various formats with various accompaniments such as onion, jalapeno, coleslaw, creamy toppings. In sandwiches or wraps, or over baked potatoes or fries! Burn Errors: Some Instant Pots can tend to give you burn errors for thick and tomato based dishes. Try the following for a successful result. Make sure to mix everything really well to pick up any stuck bits before closing the lid. Some tomato sauces can be too thick, use a mix of fresh or diced tomatoes and tomato sauce. 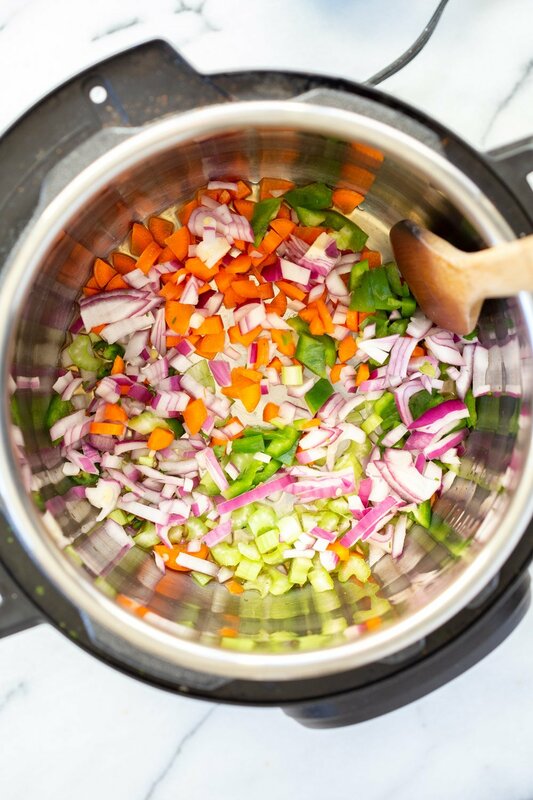 Add a bit more broth if you generally do run into burn errors in your pot. 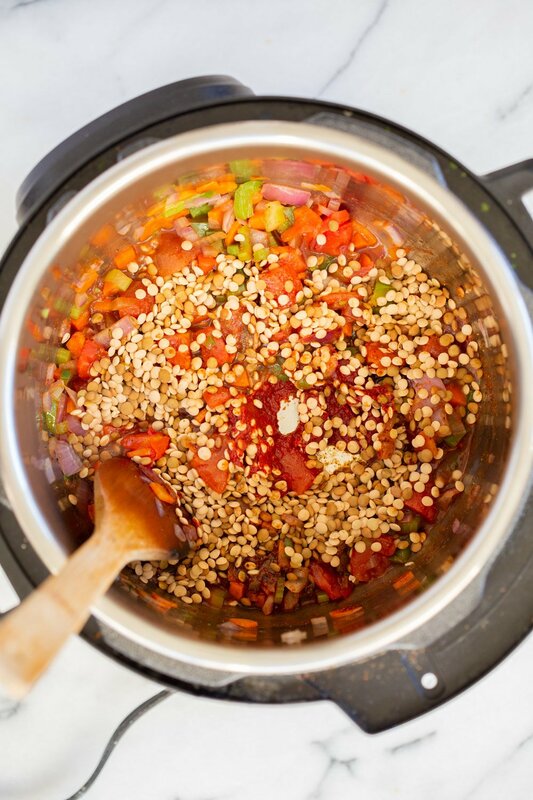 Let the veggie + tomato mixture cool for 5 mins before closing the lid. Some pots heat a bit more saute and that tends to increase the chances of ingredients scorching at the bottom under pressure. Add 2 tbsp broth in the Instant Pot on saute. Add the onion, garlic, pepper, celery, carrots and a good pinch of salt. Cook for 3 mins. Deglaze with more broth mid-way. (See saucepan instructions in Notes below). Serve in buns or bread with coleslaw or onion or crunchy greens. or in wraps or over baked potato. 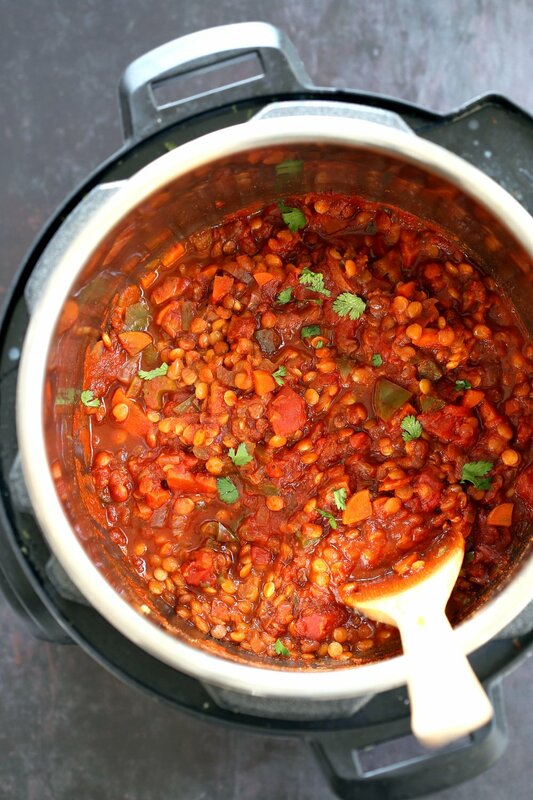 Saucepan: Rinse the lentils and combine with 2 cups of water in a saucepan over medium heat. Bring to a boil, then reduce heat slightly to medium low, partially cover, and cook for 20 to 25 mins or until al dente. Drain any excess liquid. Follow steps 1 and 2 over medium heat in a saucepan. Add only a 1/4 cup broth. Add the cooked lentils and mix well. Reduce heat to medium low, cover and cook for 6 to 7 mins to thicken and develop flavor. Taste and adjust. I can’t wait to try this! So basic and comforting. Sloppy Joes were a childhood fave. Haven’t had them in years and definitely not since going vegan. My mouth is literally watering just thinking about that first bite. Thanks Richa! I don’t have instant pot. How can I make this recipe? 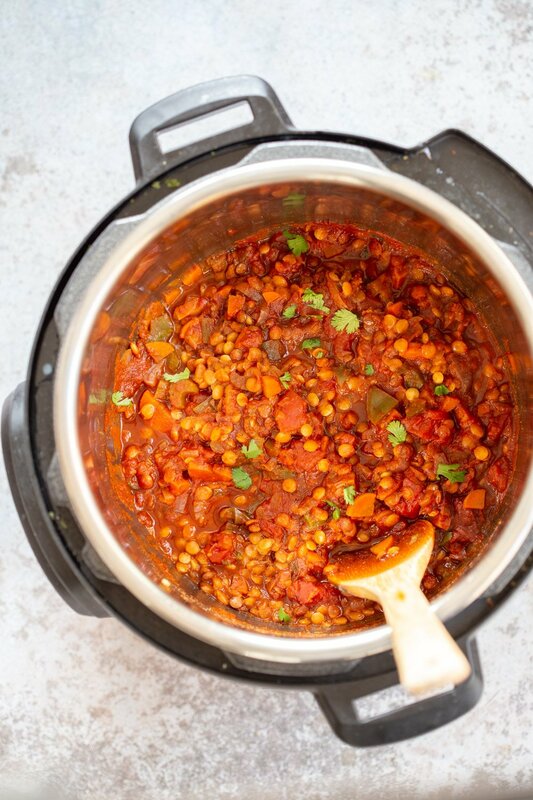 Hi Richa – how would brown lentils affect the cooking time? I have these already as I use them for the upside down Lentil Shepherd’s Pie recipe on Sundays. Easy to make, plus so tasty. It made enough for me to freeze some for a quick meal for one. I did the stovetop version and used only 1 teaspoon of Mexican spice mix as I prefer a milder meal. Delicious! Thank you for suggesting serving over potatoes – I made this yesterday and can’t wait to have it for dinner this evening! I made this a few days ago. I followed the directions exactly as its written and it came out perfect. I used a mini Instapot. Thank you!